My second-grade students have very busy bodies. I have struggled to accomplish anything in class, and I have been growing frustrated—I waste too much time trying to get their attention. After a few weeks together, I am realizing that I should find ways to focus their excitement and energy rather than stifle it. I am going to try a new approach: we will play more learning games and do fewer crafts, and I will incorporate lots of movement around the room. 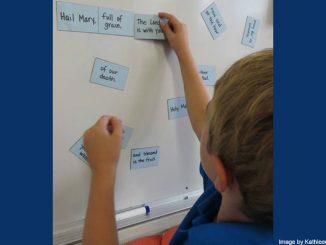 Our upcoming lesson on the Ten Commandments will be a great opportunity to practice active learning. 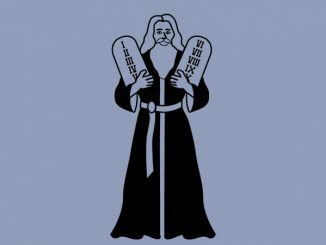 I will set up game stations around the room, and after quickly reviewing the commandments as a class, I will break the class into small groups and rotate them through each game. My stations will include classic games that don’t require much instruction: bowling, hopscotch, pick-up sticks, and matching. For our bowling game, I am going to use a children’s bowling set. If you don’t have a bowling set at home, check with your family, friends, and students’ families to see if they have one you can borrow. A number that corresponds to one of the Ten Commandments will be taped to each pin. Children will have three turns to knock down their pins. After their attempts, they will have to name a loving action they could do that would honor those commandments numbered on the pins they knocked down. I’ll make the hopscotch game out of masking tape; each square is numbered with one of the commandments. The students will toss a small stuffed animal onto the squares. They will have to name an action that would dishonor the commandment of the square in which the stuffed animal lands. Before playing pick-up sticks, I’ll write the numbers 1–10 on popsicle sticks. I’ll repeat each number a few times to extend the game. As students successfully retrieve sticks from the pile, they will need to identify which commandment matches the number on their stick. Each set of cards for the matching game will include 20 index cards. 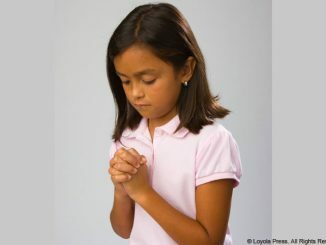 Ten cards will list the commandments, three will have the words When I follow this Commandment I am honoring God, and seven will have the words When I follow this Commandment I am honoring other people. Students will need to match a commandment card to the correct category card. I hope these games will keep my students’ bodies and minds active throughout the lesson. I would have a much more difficult time getting the children to sit still if I shared this information with them by using the book, a craft, or my own words. Do you have any games that you like to play to teach a particular lesson? Please share them in the comments section below. Shannon Chisholm is a Ph.D. candidate in Religious Education at Fordham University. Over the years, Shannon has ministered as both a catechist and Director of Faith Formation. She is currently serving as a catechist at Holy Family Parish in New Rochelle, NY. She holds a BA and MA in Theology from the University of Notre Dame. When she isn’t daydreaming about lesson plans for her second-grade class, Shannon enjoys spending time with her family, discovering new coffee shops, and cheering on the Fighting Irish. I love these ideas. I only have 2 students this year but they should still work! Thanks! 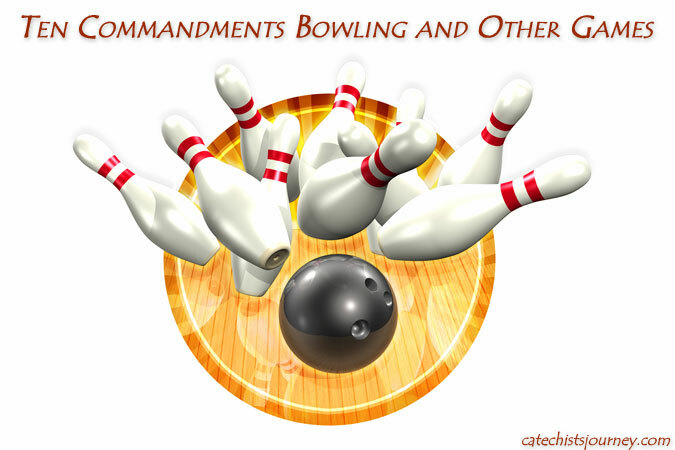 If bowling pins aren’t available you can use empty water bottles with a laminated strip, on which a commandment is written, inside. Thank you so much for sharing this great idea! What a great way to tie in the theme of caring for creation! I hope your class enjoys some of these games! Awesome thanks! Hopscotch is a great idea!! Love these! I have already done my 10 Commandments lesson, but I think maybe I can fit at least one of these in as a fun review activity. Either way, there is always next year. I had a few games for Christmas season. A Nativity bingo I made up on an online bingo creator with word/pictures from Advent to Nativity to Epiphany. Also, I took a bulletin board cut out set (something like this one https://www.amazon.com/Trend-Enterprises-T-8125-Nativity-Bulletin/dp/B000F8TG3Y and we made an easy ‘living Nativity scene’. As we reviewed questions (Who was Jesus’ mother? ; Who came to Mary to ask her to be the mother of God’s son? ; What building was Jesus born in? Who was Jesus foster father? etc) they got to come to the front of the room and hold up the piece of the set for that answer. Then in the end I had them all together and took their picture. It was an easy review, had both a physical and visual component…and the kids all loved it! Except for reading several sort saint stories about the saints in my games, my entire All Saints’ Day lesson is games. St Kateri Stone Rosary, St Therese Shower of Roses, Put the Halo on the Angel ring toss, St Peters fish and St Isidore’s corn Guessing Jars, St Francis Animal Round Up, St Anthony’s Lost and Found. I gathered the ideas from several web pages (I did not make any of them up!). I also teach 2nd grade. And let me tell you, I understand completely how frustrating it is to try to get them to think and speak out loud. They rather play than sit and learn. While I do like the occasional read from the book/ write on the board approach, this does seem like a better idea. Turn the lesson into fun and it will most likely stay with the student after class is over. Thanks for the new idea! Thank you so much, Shannon! This is EXACTLY what I was looking for! For the last two weeks, I challenged my students to memorize a song we found for the Ten Commandments. As a prize, I promised them a smelly sticker each and a game. They sort of scoffed at the idea of the game being any fun; won’t they be surprised!! Thanks, Shannon! We miss you at St. Denis! Still finding your great ideas is such a treat. on the story of Ruth and Naomi. They could not wait to get their parts!! Thank you for your ideas! !